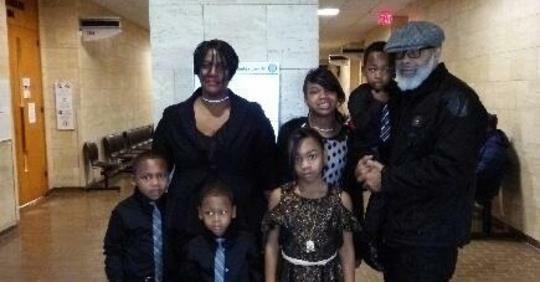 Karen and Tyrone Mack, both age 55, are celebrating their decision to adopt five siblings this past November. Though it isn’t their first go as parents — between them, they raised six children during previous marriages — it is different this time around. The children’s birth mother is Tyrone’s niece, and she has struggled with mental health issues and drug abuse. The children’s fathers have never been a constant presence in their lives. Their mother asked Tyrone and Karen to take care of her children. The children’s ages range from two to 10. There’s the oldest, Heaven, then Chanel (age seven), Hakeem (six), Hayden (five), and Jeremiah (two). The couple began caring for the girls and brought Jeremiah to live with them when he was eight months old. The other boys had been put into separate foster homes, so the Macks brought them home too. Now, they have at last adopted all of them. The Macks were living the life of empty nesters, enjoying plenty of alone time and date nights, but when the children came along, they put all of that aside to adopt them. “We were cool living our life, but our family needed us,” said Tyrone. In addition to the Mack children, 22 others were officially adopted on November 18, 2018, during D.C. Superior Court’s Annual Adoption Day. The Macks tied the record for the number of children adopted into one family on one day. Each of them is just as excited as the next, shouting with joy about being adopted.